Their team posted this tweet 20 mins ago. I’ll be posting updates here as the situation progresses. Their engineers are clearly working the problem. Dedicated Servers, DreamPress 2, Remixer, Shared Hosting, Virtual Private Servers (VPS), Webmail. Their team detected the attack at 9:20am PST and mitigation started at 10:20am PST. Dreamhost currently host an extremist website called punishedstormer. The site’s DNS is also hosted by dreamhost. That means that if you try to access the site, your computer or device contacts Dreamhost’s servers and asks for the IP address so that it can connect. The attackers have launched a massive amount of traffic targeting Dreamhost’s DNS servers so that the website they want to take down becomes inaccessible. 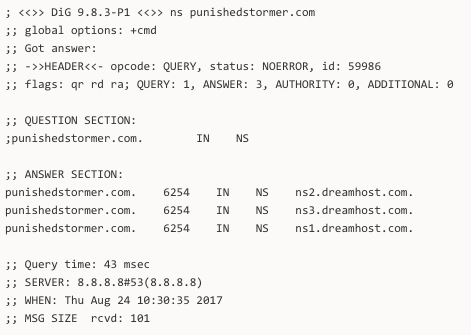 As you can see, the servers ns1, 2 and 3 at dreamhost.com are responsible for handing out the IP address of anyone looking up punishedstormer’s address. These are being targeted, possibly along with other DNS servers at dreamhost. This will affect the availability of any website and domain that is using Dreamhost DNS services. 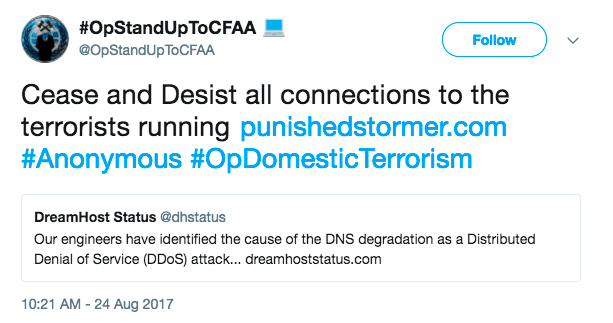 If you host your website at dreamhost, you may not be affected by this attack if you host your DNS with another provider. If you host it with Dreamhost, it is likely that you are affected. Unfortunately there is not much you can do. If you move your DNS away from Dreamhost, it will take up to 48 hours for the update to propagate around the Internet. Dreamhost will probably have this situation resolved in the next few hours. So the best advice may be to sit tight until their engineers are able to filter out the DDoS traffic and bring their systems back up. It is worth noting that if your domain’s DNS is handled by Dreamhost, then your email deliverability may be affected. Emails that are sent to you may be bounced back to the sender. If you are expecting an urgent email, we recommend that you contact the sender directly and let them know your email may be temporarily unavailable. Once this service disruption ends, you may want to let your contact list know that your email may have been temporarily unavailable due to an attack on your email DNS hosting provider. 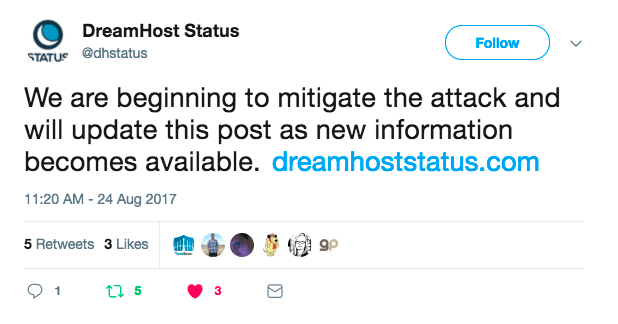 Update at 11:22am PST: Dreamhost are reporting that they are beginning to mitigate the attack. Update at 12:36pm PST: Dreamhost is reporting all services are restored and operational, although they show many services in a ‘degraded’ state. You can find out more information on their status page. 32 Comments on "Dreamhost is Under DDoS Attack"
"Their team detected the attack at 9:48am PST (1 hour ago at the time of this writing) and mitigation started at 9:40am PST (about 30 minutes ago)." Oh darn. Sorry to hear that. I'm also getting reports that things are beginning to come back online. Still seeing some down reports thought. Yeah, I'm only seeing about 50% restoration so far. I imagine it's going to be a bit of time still. I'm quite curious how the afternoon will shake out. FYI, https://panel.dreamhost.com/index.cgi is now out of service. The stormer supposedly "hacked itself" a week ago to drum up sympathy. That hasn't been confirmed, but seemed believable at the time. Any idea if this might be a similar situation to get lots of free press, or is the Anonymous messages coming from a trusted Anonymous affiliate? The trouble is that anonymous is... anonymous. But based on what I'm seeing, this is a DDoS attack from an external group. The site owners haven't demonstrated any kind of technical capability. I'm seeing anon affiliated twitter accounts making noise about this. Email sent to you shouldn't be bounced/lost it should be held on the sending SMTP relay server for a typical minimum of 2 days whilst the sending server isn't able to connect to the receiving. Emails will definitely be delayed incoming, though. Sadly, I'm old enough to remember those days. Thanks Kirrus. Agreed - I think the bounce reports I'm seeing are the initial SMTP "delayed" notifications that people are reporting on twitter. My news publication host with Dreamhost on a vps server and it is not down. Yep, I'm on Dreamhost so all of my sites are down. All of my sites are down, unable to receive or send domain email. Great. Just curious...what steps would Dreamhost be taking now to mitigate the attack? Just block all the IPs the attack is emanating from? PS. Thanks for all you and your team do, Mark! They're probably chatting to an upstream provider like NTT to have them route all traffic to the affected IP blocks through a layer 7 DDoS scrubbing service. Granted, I think we can all agree that any version of the D---y S-----r shouldn't be hosted anywhere, but if an entire ISP can be taken out because someone doesn't like a site that's hosted on it, how should a business choose a host? I'd say situations like this are the luck of the draw. Tomorrow it could be GoDaddy, or Hostgator or Bluehost. It isn't really predictable. Exactly. And you'll end up spending a ridiculous amount of time sorting through endless WHOIS records to find that "perfect" host. It just doesn't exist. My company's site was affected by this. Do you think a service like Cloudflare can help us non-technical people avoid down times like this? Or are they just as vulnerable? They'll stop a DDoS on your website. They would not have helped if your DNS was hosted with Dreamhost - even if you used their website cache/waf service. Even if you move your DNS to cloudflare, if your origin server is hosted at a host and they go after infrastructure (e.g. DDoS a router) then all bets are off. The trouble with cloud wafs is that attackers can just go around them. Read about the cloud WAF bypass problem here. Jason, I think its more appropriate to say the message of D---y S-----r should be rejected, but we shouldn't care where it's hosted, or that it is hosted. Nor do we want the host company attacked for hosting it. People and organizations should be able to post any content messages they like, and it's up to the rest of society to reject and shun the message and messenger if it's offensive material. It is not up to any of us to take away their natural right to express their views, no matter how foul they are. 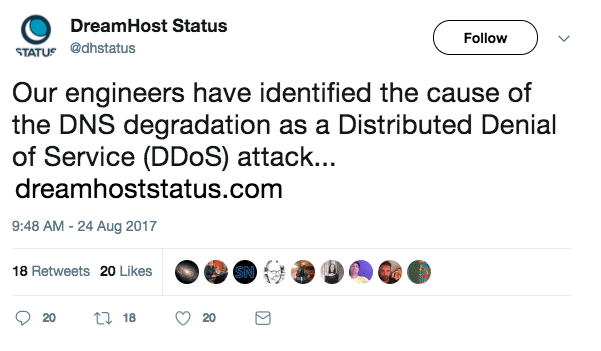 Anonymous, or whoever is behind the DDoS attck, is hurting the rest of society, by assuming they are the arbiters of which messages are acceptable, and which are not. I don't want them thinking for me. I presume you don't either. I've been having this debate with Pat Gray of Risky Biz on Twitter. I've been taking the "free speech" side for a while, but he's doing a great job of making me see the other side of the argument. I don't think any company should be compelled to host extremist content - and I think it's also OK to "fire a customer" when their business is very obviously disagreeable. Mark, please don't misconstrue what I am saying: Dreamhost is and should be free to reject anyone as a customer. Business relationships should always be voluntary. The difference, in this case, is that someone is trying to make that decision for Dreamhost, by causing them criminal harm. I feel this is a good time to point out that Dreamhost is not a good hosting company, they use very dishonest marketing on their website, and their products are slimy, at best. For example, their "Virtual Private Server" product is not a real VPS. You don't get root access, and you can't install MySQL, you have to use a shared SQL database, which is by it's definition not "private". They offer a private option if you spend more money, but advertising the shared version as a VPS is dishonest. Also, all shared hosting is dishonest, by nature, which is the core of Dreamhost's business. Do they deserved to get DDoSed? I don't know, but I'm not shedding any tears over them. Don't kick them while they're down. 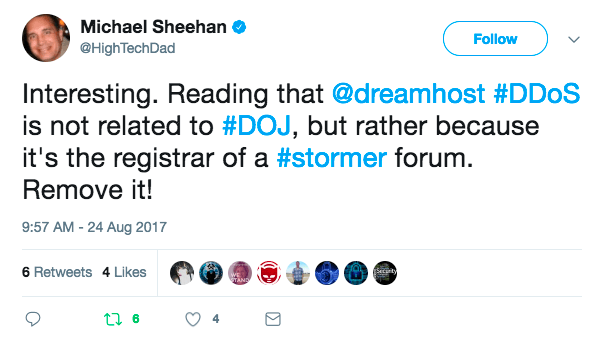 A DoJ decision didn't go their way this morning and now Anon is DDoS'ing them over a new stormer website they're hosting. I wouldn't be so sure it has absolutely nothing to do with the disruptj20.org site, this from a few hours ago. Chief Judge Robert Morin ruled that DreamHost, an LA-based web-hosting company, must turn over data about visitors to the website disruptj20.org, which is a home to political activists who organized protests at the time of Donald Trump's inauguration as U.S. president in January, many of whom have since morphed into the controversial "antifa" movement. Yup, we're aware of all that. Check twitter. Anonymous are targeting DH because they're hosting a new stormer site as of this morning. Dreamhost are having a bad day. Doing a "jwhois punishedstormer.com" yields godaddy, 18.39 hours.